(Nanowerk Spotlight) The Proton Exchange Membrane Fuel Cells (PEMFC) are certainly promising as energy efficient devices to run vehicles in a less polluted way. They can burn fuel in such a clean way that the exhaust would contain nothing but water and dissipated heat. If fuel cells are such cool devices empowering next generation automotives then why have they not yet been commercialized? The problem lies at the heart of the chemical reactions taking place inside a fuel cell and unfortunately, they are inherently sluggish. We need catalysts to make these reactions happen faster. Platinum, even today, is being thought of as a wonder catalyst. But such an idea is nothing but impractical. Simply because platinum metal is scarce, overly expensive and despite using it in a fuel cell the reactions are still slow. Fuel cells would still be expensive, even if we replace big chuncks of platinum metal with an assemblage of tiny platinum nanoparticles. Hence, a real practical solution needs to be found in terms of designing nanocatalysts that not just accelerate the reactions much faster compared to platinum but, are cheaper and durable. With this principal motivation, we – researchers at the Department of Materials Science and Engineering, McMaster University, Canada – collaborated with Dr. Christina Bock (National Research Council, Ottawa, Canada) in characterizing platinum-iron alloy nanocatalysts that were found to have the best catalytic activity among other similar systems reported so far. 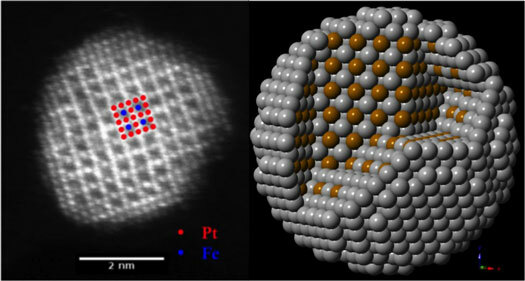 The work has been published in the June 17, 2013 online edition of ACS Nano ("Strained Lattice with Persistent Atomic Order in Pt3Fe2 Intermetallic Core–Shell Nanocatalysts"). Iron is substantially cheaper than platinum. So, how about substituting platinum with iron in such a way that in addition to making these catalysts significantly cheaper, we also achieve a much better activity and catalytic durability? With this idea, Dr. Bock looked beyond disordered systems that were reported in the past and synthesized them in a very different way so as to make them ordered. About 10,000 electrochemical cycles were run to assess their activity and it was found that they were not just very active compared to pure platinum but, remained highly durable during these cycles. But why? We were puzzled by these results and wanted to explore the reason at an atomic-level. We studied this using one of the most advanced electron microscopes in the world, hosted at the Canadian Center for Electron Microscopy (CCEM), McMaster University. "This microscope is so powerful that we can easily identify individual atoms, measure their chemical state, and even probe the electrons that bind them together," says Dr. Gianluigi Botton, the scientific director of CCEM and the senior author of the paper. "When we observed the as-prepared catalysts – average size of 3.19 nm – under the microscope we found that they had an ordered intermetallic core encapsulated within a bilayer thick platinum rich shell." These are the newest members to platinum-iron alloy nanocatalysts with such intermetallic core-shell (IMCS) design. Furthermore, on characterizing them after 10,000 cycles we still found them to retain their structural ordering at the core while the platinum shell got thicker and thicker. Such a static core-dynamic shell (SCDS) regime is being reported for the first time. While the observed enhancement in the activity is attributed to their strained lattice, our findings on the degradation kinetics establish that their extended catalytic durability is attributable to a sustained atomic order. Although our work was specific to platinum-iron IMCS designs, the findings carry much broader implications to understand why and how an ordered IMCS design is better and cost-efficient compared to disordered core-shell nanocatalysts. In summary, ordered intermetallic core-shell nanocatalysts are highly promising designs to realize future fuel cell vehicles and fine-tuning them at an atomic-scale is a great leap forward.